projected in January 2008 that the city will face a $70M shortfall by the end of the fiscal year. The City Council passed Resolution 08-R-0186 requesting a performance audit of the City of Atlanta 2008 general fund budget process. Charter provisions dating from 1937 make revenue anticipations artificially low. The city has budgeted more carry-forward than it ended up with at the close of the year. 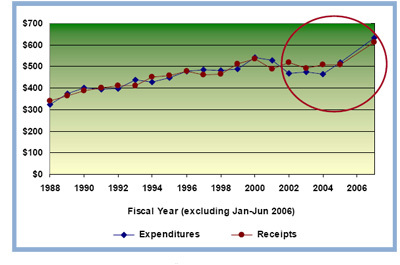 The city overspent its budget in the first six months of 2006 (the transition period to a new fiscal year) and in fiscal year 2007 (July 1, 2006 – June 30, 2007). The city had budgeted to use to $64.6M carry-forward from FY 2007 in the FY 2008 budget, but had less than $1M cash available when the FY 2007 books were closed.